*Post by Julie Gibbons. Read part one of this series here. 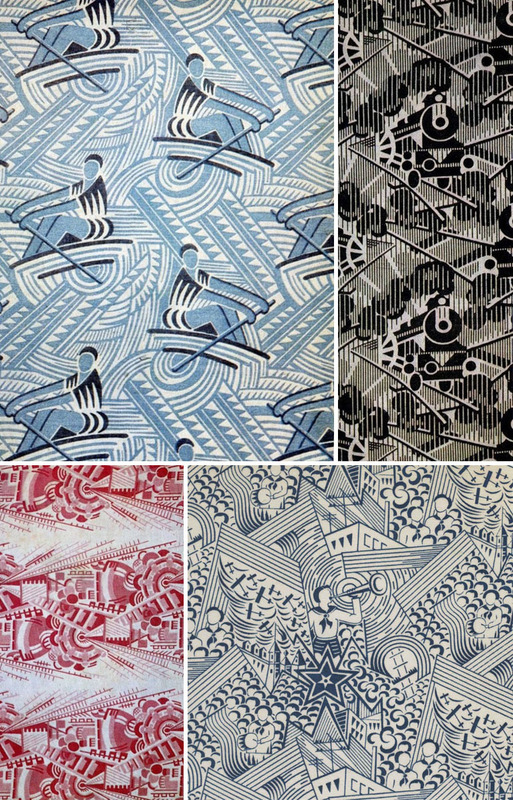 Despite its initial burst of enthusiasm with champions of geometric design such as Stepanova and Popova, textile production in Russia in the 1920s continued to clunk along, suffering from a shortage of skilled designers and technologists, and also from outdated machinery and factories. 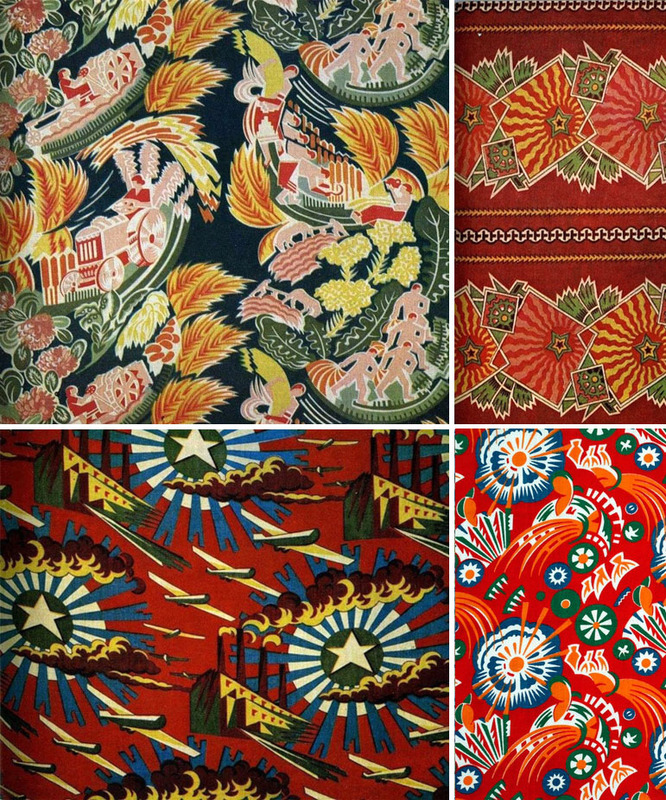 The new geometrics were increasingly relegated to small handicraft organisations and fashion houses catering to the wealthy, and low quality fabrics with traditional motifs continued to predominate in mass production. Cultural change was slow, and it was only when the first group of professional designers had graduated from the new training schools set up at the beginning of the 1920s that textile design started to move forward again. Inspired by idealism, industry and the heroic worker, these are constructivist designs at their most vibrant. 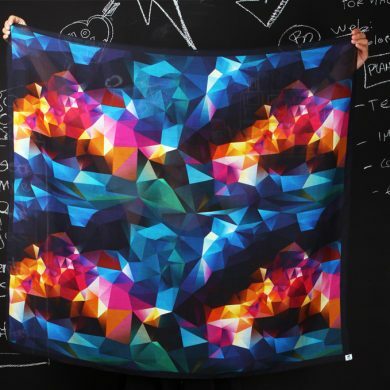 According to this group of young designers, fabric design had to both reflect life, and change it for the better. Themes of construction, electrification and accomplishments in science in culture were explored, and motifs such as tractors, the star and sickle, fitness, factories and planes all made an appearance. The designs were dynamic, full of rhythm, movement and Utopian visions. Subject matter was stylised and reduced to flat, graphic planes of colour, and designers formulated them into repeats using standard design techniques to draw it all together, such as a limited palette, and uniform fills of geometric or abstract elements for the background. Sometimes designs were a hybrid of constructivism and more traditional folk and pictorial styles. Designers got a bit wilder, and a few “agitational” designs appeared featuring motifs of army tanks, planes and soldiers. 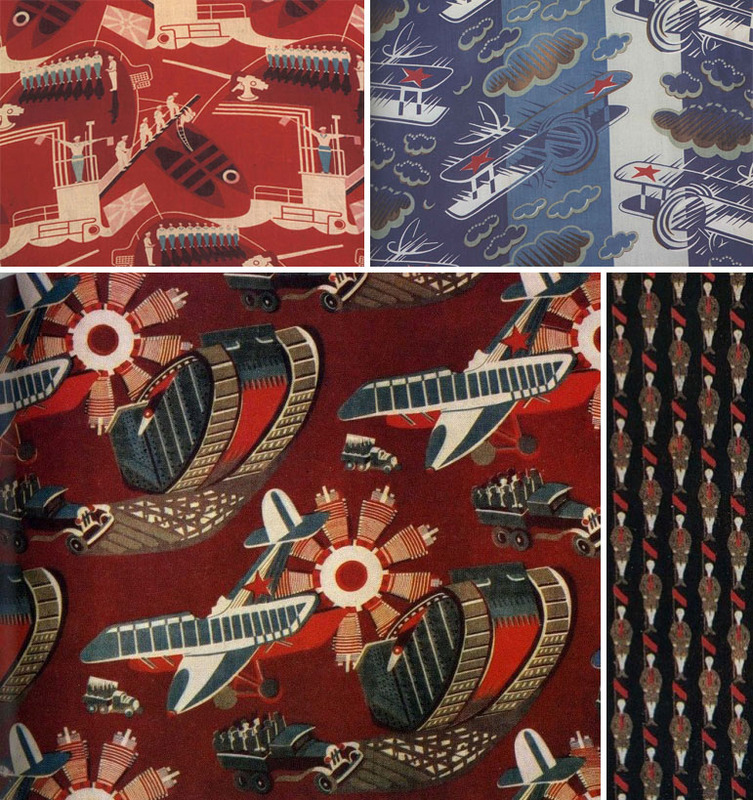 The government adopted a resolution in 1933 on “Inappropriate Design”, and banned thematic motifs in fabrics. Soon after, the trend all but disappeared, and only started to make a reappearance in the 1950s. Thank you so much for this post! What a fascinating history. I do love the rhythm and boldness of these prints. They remind me of Kandinsky paintings of the same era. Nice article Miss Julie.